The G chord on guitar is one of the most common chords of all. 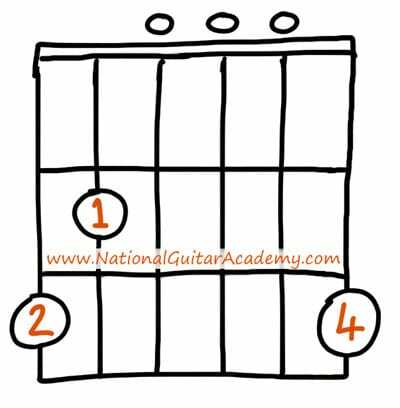 Along with C, Em and D the G guitar chord pops up again and again. 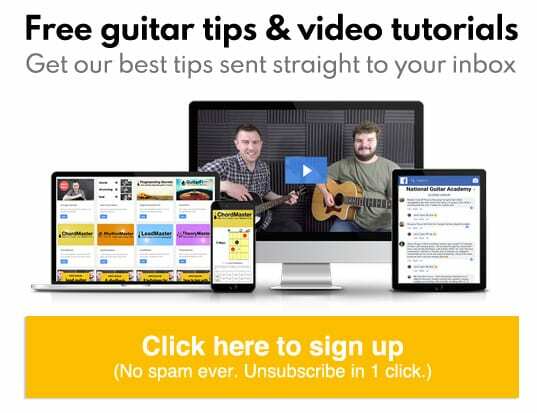 If you want to learn guitar you must be able to play a G chord, so let’s learn! The G chord on guitar is a strange shape but it will quickly feel familiar as you’ll play it so often. As you can see, this unusual shape requires 4 fingers to play. As a beginner guitarist you’ll find this quite hard as you won’t have much accuracy and control in fingers 3 & 4 yet. Let’s look at some easier alternatives that you can use during the early stages of your guitar journey. 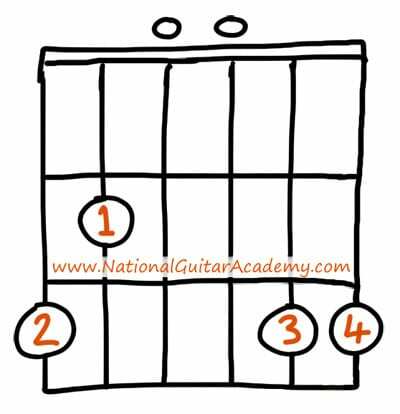 As you can see, this G chord requires only 2 fingers to play, so it’s significantly easier to play than a normal G chord for a beginner guitarist. Sure, it doesn’t sound quite as good as a full G chord, but it’s a lot easier to play and as I’ve written elsewhere on the site, in the early days of your guitar journey the most important thing is that you have fun and simply get accustomed to holding and strumming the guitar. You can perfect and finesse chords later (and for many, many years into the future), but you should know that the most precarious time in your life as a guitarist is when you’re first learning. If you’re going to stick with the guitar and continue playing it -and I dearly hope that you will- it’s vital that you have fun and enjoy practising. And that’s why I recommend you use G6 as your beginner G chord on guitar. The rule is simple: whenever you need to play a G chord on guitar, you play G6 instead. 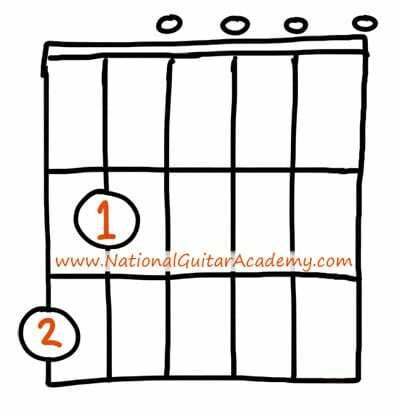 Learning the G chord on guitar is interesting because you can play it in a variety of ways. In this version of G chord you can see that we’ve introduced finger 4 (your little finger). This is a perfectly valid G chord and lots of people play the G chord on guitar like this for their whole life. This 1-finger version of G is a superb way for kids or adults with learning difficulties to play the G chord on guitar. It doesn’t sound as well-rounded as the 4-finger version of G Major (of course), but it does the job and is very, very easy to play. Here are the most common ways to play a G chord on guitar. Some are tough, but don’t worry, you can use the easy version above until you develop your control and strength to tackle the harder versions! Even more G chords (sixths, augmented, diminished etc).